Jesse Ferreras The Huffington Post B.C. Vancouverites love their coffee, and they're particular about it. A couple of weeks back, data revealed that Vancouverites prefer Starbucks over Tim Hortons more than any other Canadian city, Canada.com reported. That isn't necessarily a reflection of how much they love Starbucks, just that most people won't settle for any cup of joe. Starbucks doesn't even register on the coffee and tea ratings on Yelp.ca. Instead, Vancouverites lean towards cafes that offer original, fair trade, organic brew more than franchise outlets. But it's not only the product, favoured cafes also boast funky surroundings, memorable staff and tasty munchies. "People who visit Yaletown go to Starbucks, people who are from Yaletown go to Agro Cafe," says a Yelp user. Agro Cafe boasts a warm atmosphere and a rustic appearance. They handpick their coffee beans, which are then removed, washed and sun-dried before being brewed into delicious cups of joe. It's easy to miss when you walk past, but Coo Coo Coffee on Davie Street in Yaletown is a favourite of Yelp readers. They love the shop's original beans, its communal atmosphere and its housemade sandwiches and wraps. 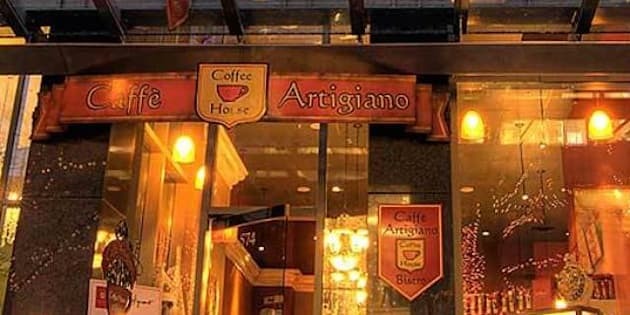 Caffe Artigiano boasts champion baristas and coffees inspired by Italian tradition. Some of their latte art rivals stuff you hang on your wall. It's the only prominent coffee franchise on this list. Don't let the name throw you, it doesn't have the oppressive, poorly ventilated interior of a Franz Kafka novel. Instead, it offers coffees brewed four different ways in a setting that functions just as effectively as an art gallery. Innocent Coffee and the Upper Room offers drinks roasted weekly by Origins Organic Coffee and Bows X Arrows Coffee Roaster. Pastries are made daily, and upstairs there's a boutique selling illustrations, gift boxes, greeting cards and books. One thing though: they only serve coffee in paper cups, so bring your own if you have any objections. Talk about a coffee shop that hardly looks as though it belongs in Vancouver. Caffe Cittadella bills itself as an authentic Italian cafe, located in a 19th-century heritage house. Yelp readers praise the cafe's service, its decor and its tasty lattes. This one may have more to do with location than coffee, but it's hard to beat the Gallery Cafe in downtown Vancouver. Nestled atop the art gallery entrance, it's a busy destination for the lunchtime crowd and offers mocha, latte, cappuccino and Americano. Not exactly the most robust coffee menu but hey, the people have spoken. More chocolate shop than coffee shop, Thierry offers some great desserts to go along with a nice brew. Matchstick Coffee probably boasts one of the best looks for any coffee shop in the city. It's tucked into a small, open space in Mount Pleasant, where baristas offer authentic Latin American coffee from Colombia, Costa Rica and Peru. They also make probably the best almond croissant in the city. This place is known more for coffee than it is for chocolates, but that just makes it a great place for both! The cafe offers organic, fair-trade coffees and "brewed-on-demand" Clover brand coffee. Prominently located on the Broadway Corridor near Cambie, Elysian Coffee is a cozy little cafe that provides a great variety of coffee and fresh baked goods. Yelp users call the baristas true connoisseurs of the bean. It's not exactly fair to stick this company here, given that the next entrant uses their beans, but 49th Parallel Coffee Roasters still ranks highly among Vancouver coffee outlets. The company prides itself on producing beans from farmers that the owners communicate with directly, as well as their "meticulous" cupping of every brew. Located in Harrison Galleries in Yaletown, the Buzz Cafe offers coffee brewed with 49th Parallel beans, along with a selection of breakfasts and baked goods. Its website bears nothing but its name, but maybe that's because it doesn't need to pitch you its coffee. Revolver gets high ratings for its NYC-inspired look, its high-quality beans and its rich cappuccino. It's pricey, but in this case you pay for quality. At the corner of West Pender and Homer streets, Finch's offers fair trade, organic coffee and a lengthy menu of enticing items from bocconcini baguettes to PLTs — that's prosciutto, lettuce and tomato.